Changes in tissue stiffness have long been associated with disease. Quantification of tissue stiffness is needed to reveal diffuse disease, e.g. liver fibrosis. There is strong evidence that in some cases quantification of tissue stiffness can supplement or replace hazardous biopsy methods. Spatially Modulated Ultrasound Radiation Force (SMURF) imaging is a technique for quantitative elastography (imaging of shear modulus) developed in our laboratory. The principle ofSMURF imaging is to use acoustic radiation force to generate a shear wave of known wavelength (λ) in a material of unknown shear modulus and measure the temporal frequency of the propagating shear wave to determine the shear modulus of the material. The frequency (ƒ) of this wave, which depends solely on its point of generation and not the surrounding environment, is then measured to determine the shear modulus (G) of the tissue using the relationship G=(λƒ)2ρ, where ρ is the tissue density (˜ 103kg/m3). The frequency is estimated from tissue motion tracked ultrasonically using the same transducer that generated the radiation force beam. The pulsed nature of the shear waves avoids interference from standing waves inherent in continuous wave methods, while the use of acoustic radiation force to generate the shear wave at the point of interest eliminates difficulties in propagating a shear wave from the body surface to the region of interest, i.e. attenuation, refraction, and slip boundaries between tissues. Our preliminary in vitro studies have shown that SMURF imaging is capable of providing rapid estimates of shear modulus in good agreement with values obtained through standard mechanical testing methods. 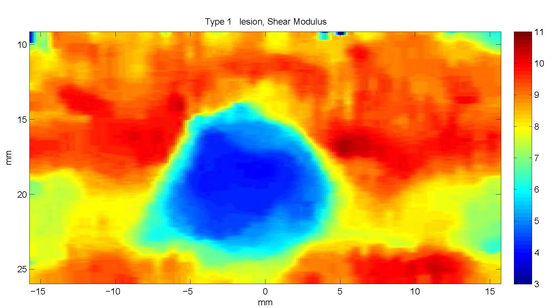 Images of shear modulus can be generated with data collected in a fraction of a second. Researcher: Stephen A. McAleavey, Ph.D.